The Nantahala National Forest, established in 1920, is located in the most southern portion of the Appalachian Mountains in North Carolina. 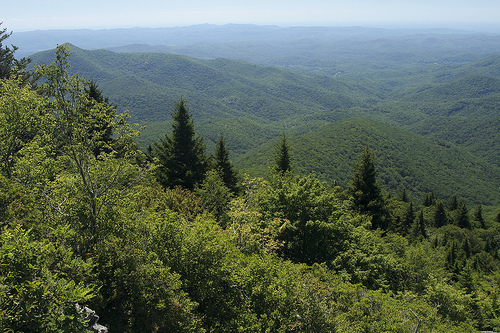 Covering thousands of acres in parts of Macon, Jackson, Transylvania, Graham, and Swain Counties and managed by the U.S. Forest Service, it is the largest of North Carolina's four national forests. Named for the Indian word meaning "land of the noonday sun," Nantahala is publicly held and managed for numerous purposes, including timber production, agriculture, wildlife management and preservation, and recreation. The Nantahala region features a number of mountain streams with cascades and waterfalls, deep pools, and rivers as well as many ponds and lakes, some very large. At 3,013 feet, Nantahala Lake, created when a dam was built across the Nantahala River, has the highest elevation of any lake in North Carolina. The river itself is found in the Nantahala Gorge, which follows along a fracture zone called Murphy's fault. The river then flows northeast and drops 900 feet into Fontana Lake. The 3,800-acre Joyce Kilmer Memorial Forest, part of the Nantahala National Forest and the Joyce Kilmer-Slickrock Wilderness, is one of the largest areas of old-growth trees, or virgin forest, in the eastern United States. It was dedicated in 1936 in honor of poet Joyce Kilmer. Famous for his poem "Trees," Kilmer was killed in action during World War I. A two-mile National Recreation Trail allows visitors to walk among towering trees such as poplars, hemlocks, and oaks, many of which are hundreds of years old. James Bannon, North Carolina: A Guide to Backcountry Travel and Adventure (1996). George Scheer, North Carolina: A Guide to the Old North State (1982). "5720 feet overlooking the Nantahala National Forest from Devil's Courthouse." Image courtesy of Janet Tarbox. Available from http://www.flickr.com/photos/tarboxje/6098694064/ (accessed November 27, 2012).